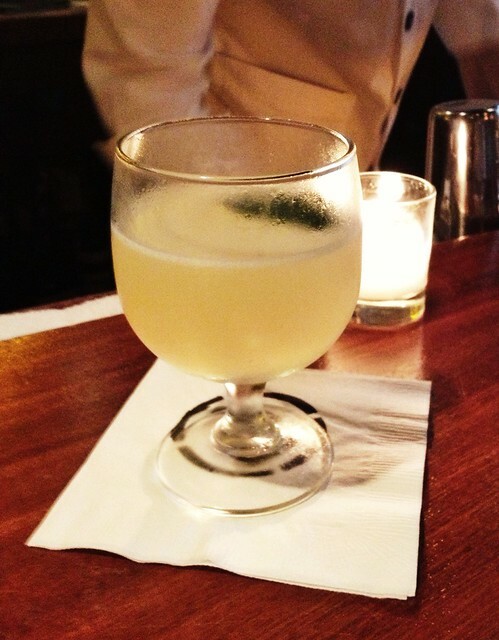 Four Tines and a Napkin: Drinks | Macao Trading Co. 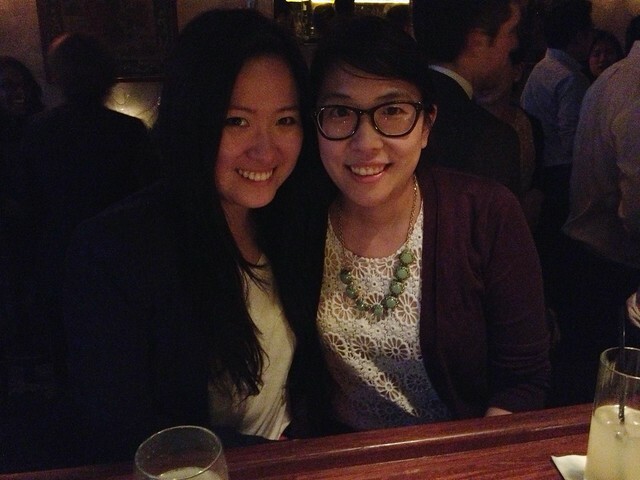 Right before Memorial Day Weekend, Erin and I made our way to Macao Trading Company for a round (well, maybe two :P) of catch-up drinks and bites. She had been meaning to go there for a while now, so I was glad we could finally cross it off our list! 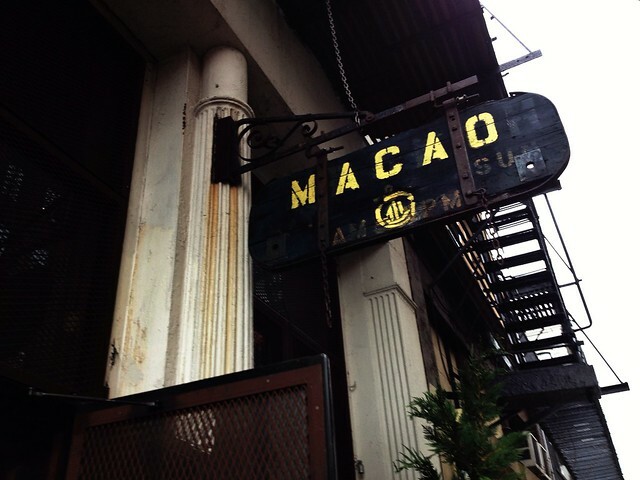 Macao Trading Co. "takes its inspiration from the brothels and opium dens of old 1930s Macau, an exotic time-out-of-time place," one that is simultaneously "mysterious, adventurous, and decadent." Roughly the size of Manhattan, Macau was "the first and last European trading outpost in East Asia" which lived under Portuguese sovereignty for nearly 500 years. Macao's name is derived from a-ma-gao, which is Chinese for "Bay of A-Ma." A-Ma (also known as Matsu) was "the Chinese goddess of seafarers and fishermen for whom they had erected a temple on the peninsula." Macau became a global converging place for merchants from all over the world, resulting in "a clash of cultures" and "a juxtaposition of 'East Meets West.'" Most notably, the Peninsula's "Red Lantern District" was a sanctuary for "smugglers, pirates, gamblers, and war profiteers," where its infrastructure would eventually become exploited for a gambling ground by the Chinese. What's also really cool about the particular spot (i.e., Macao Trading Co.) is that Erin and I took a high school-organized trip to Portugal back in 2005, so we could really see the Portuguese influences in the streets of Macau when we visited years later. The same could be said when we stepped foot into the cocktail den created in the space at Macao Trading Co.
We didn't want to commit to a large meal of dinner, so we sat at the bar for a more interactive experience with the bartenders. 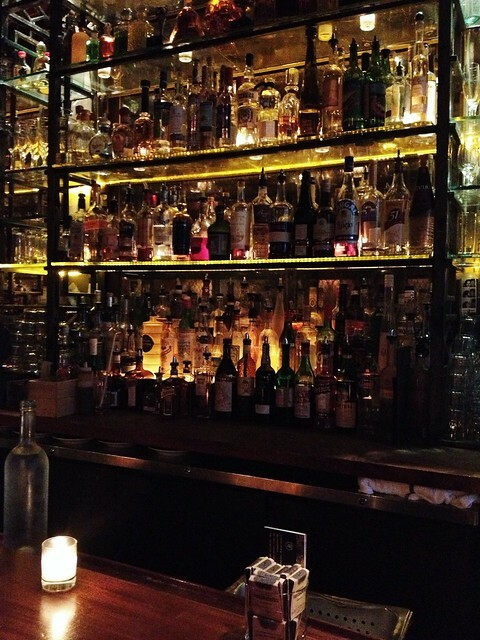 Plus, the swanky looking liquor shelf that lined the mirrored walls behind the bar was quite the pretty sight. 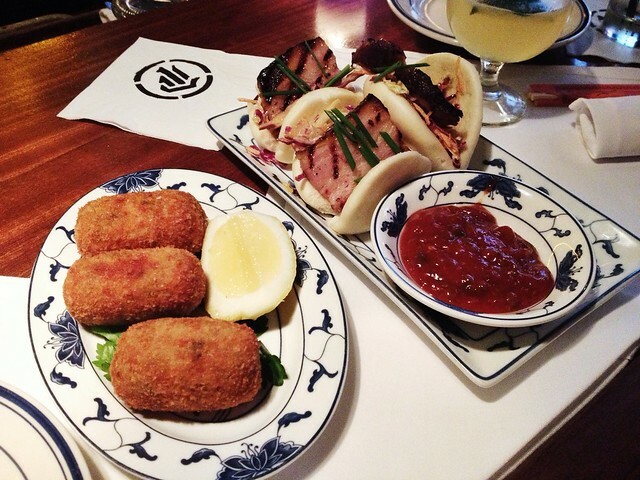 The signature Eurasian cuisine at Macao Trading Co. is a "sumptuous blend of Chinese and Portuguese influences" while the cocktail offerings are uninhibited and multi-sensory. I started out with the Bashful Maiden -- Hendrick’s gin shaken with St. Germain elderflower liqueur, Velvet Falernum, lemon juice, and puréed striped melon -- served straight up. An herbaceous yet refreshing drink, this cocktail was a little denser than you would think, but this prolonged my enjoyment of it. Definitely different than any elderflower cocktail I've had before. Also, its moniker is clever and right on target -- the drink is delicate and beautifully crafted as well as intoxicatingly fragrant. Highly recommended, especially as it appears on more permanent Fancy Cocktail section of the menu. Erin developed a really good rapport with Shone, our bartender that evening. 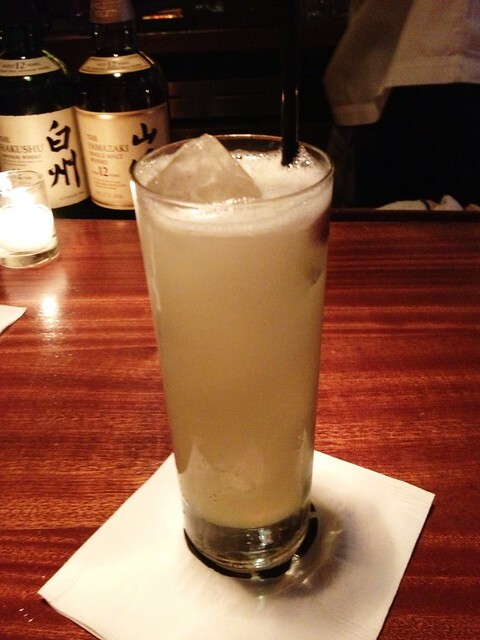 She was having a hard time deciding on a cocktail, so after getting acclimated with her preferences, he recommended that she try the Kaffir Jimlet -- Kaffir lime-infused Fords gin mixed with lime juice and agave nectar -- served straight up. The Kaffir Jimlet had a certain je ne sais quoi to it, something you don't normally find in your regular ol' gimlet. Perhaps it was the more concentrated flavor and aromatics from the Kaffir lime or the honey-like addition of agave nectar that created a nice viscosity to it. Perfect for those citrus lovers out there! For bites, Erin and I first ordered the mushroom and truffle croquettes as well as the grilled bacon buns with black garlic slaw and spicy housemade ketchup. The croquettes were piping hot with the crispiest exterior that was browned to a loose crunch as the earthy cream oozed appetizingly with the strong aroma of truffle wafting out. The grilled bacon buns were more than just crisp slabs of bacon on mantou (i.e., Chinese steamed bread/bun) -- the slabs had the blackened lines from the grill, adding that extra burnt, smoky flavor to them. The slaw had a concentrated garlicky essence to it, giving the buns another reason to be awesome. I didn't put too much of the housemade ketchup (really spicy in larger doses), but a few drops gave it a well-seasoned kick. 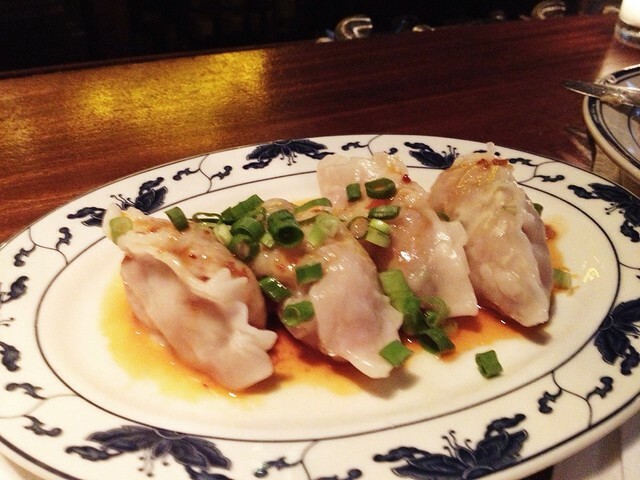 We were craving one more dish, so Shone told us we had to try the steamed chicken and pork belly dumplings (which are also offered pan-fried). I'm not a dumpling stickler or anything, but when it comes to these "pan-Asian" or "Asian-fusion" places, they're nothing to write home about. However, the ones at Macao Trading Co. were quite good -- really good flavor to them (they tasted homemade, not frozen) and not at all salty. Good call on the steamed preparation! Round two of drinks included Cry Baby (for me, above) -- Leblon cachaça with Dolin dry vermouth, ginger honey syrup, lime juice, and ginger beer; and Westside (for Erin, not pictured) -- Charbay Meyer lemon vodka with mint and fresh lemon juice, shaken and served straight up with a splash of soda. Chances are if there's a drink with ginger beer on the menu, I'll have a compulsion to order it -- I just really like how well it goes in cocktails, and Cry Baby was no exception. 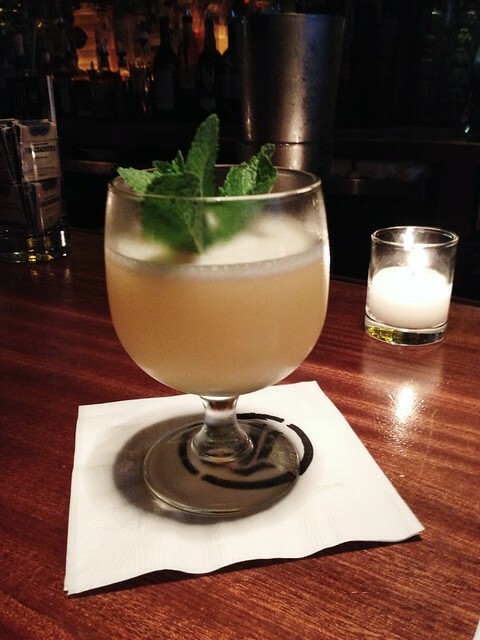 The Westside was a very lemony kind of mojito -- very simple but still outstanding. Another set of drinks that we loved! 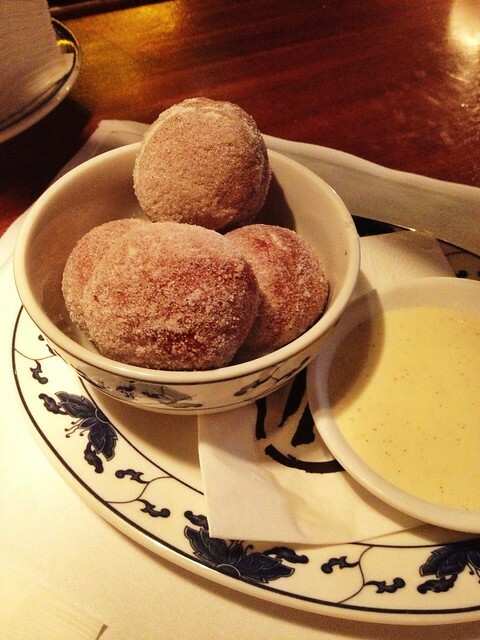 For dessert, we had fresh malasadas, which are Portuguese-style doughnuts with crème anglaise. They came out super warm and collapsed like fried clouds onto our palates with a little touch of cream. What a perfect way to end a fabulous night! Erin and me at the bar inside Macao Trading Co.
Price point: $14-15 for each cocktail, $9-12 for each small plate, $8 for dessert.